In Questions 1–11, choose the alternative that gives the area of the region whose boundaries are given. 1. The curve of y = x2, y = 0, x = −1, and x = 2. 2. The parabola y = x2 − 3 and the line y = 1. 3. The curve of x = y2 − 1 and the y-axis. 4. The parabola y2 = x and the line x + y = 2. 5. 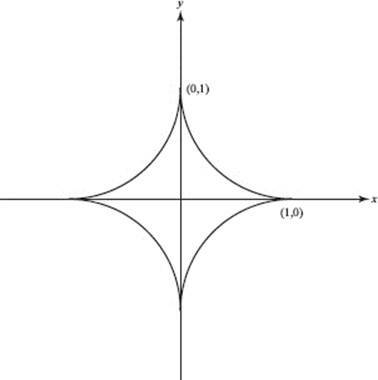 The curve of the x-axis, and the vertical lines x = −2 and x = 2. 6. The parabolas x = y2 − 5y and x = 3y − y2. 7. The curve of and x + y = 3. 8. In the first quadrant, bounded below by the x-axis and above by the curves of y = sin x and y = cos x. 10. The curve y = cot x, the line and the x-axis. 11. The curve of y = x3 − 2x2 − 3x and the x-axis. 17. The figure below shows part of the curve of y = x3 and a rectangle with two vertices at (0,0) and (c, 0). What is the ratio of the area of the rectangle to the shaded part of it above the cubic? In Questions 18–24 the region whose boundaries are given is rotated about the line indicated. Choose the alternative that gives the volume of the solid generated. 18. y = x2, x = 2, and y = 0; about the x-axis. 19. y = x2, x = 2, and y = 0; about the y-axis. 20. The first quadrant region bounded by y = x2, the y-axis, and y = 4; about the y-axis. 21. y = x2 and y = 4; about the x-axis. 22. y = x2 and y = 4; about the line y = 4. 23. An arch of y = sin x and the x-axis; about the x-axis. 24. A trapezoid with vertices at (2,0), (2, 2), (4,0), and (4,4); about the x-axis. In Questions 36–40, choose the alternative that gives the area, if it exists, of the region described. 36. In the first quadrant under the curve of y = e−x. 37. In the first quadrant under the curve of y = xe−x2. 38. In the first quadrant above y = 1, between the y-axis and the curve xy = 1. 39. Between the curve and the x-axis. 40. Above the x-axis, between the curve and its asymptotes. In Questions 41 and 42, choose the alternative that gives the volume, if it exists, of the solid generated. 41. at the left by x = 1, and below by y = 0; about the x-axis. 42. The first-quadrant region under y = e−x ; about the x-axis. In Questions 43–47, choose the alternative that gives the area of the region whose boundaries are given. In Questions 48–54 the region whose boundaries are given is rotated about the line indicated. Choose the alternative that gives the volume of the solid generated. 48. y = x2 and y = 4; about the line y = −1. 49. y = 3x − x2 and y = 0; about the x-axis. 50. y = 3x − x2 and y = x; about the x-axis. 51. y = ln x, y = 0, x = e; about the line x = e.
52. The curve with parametric equations x = tan θ, y = cos2 θ, and the lines x = 0, x = 1, and y = 0; about the x-axis. 58. 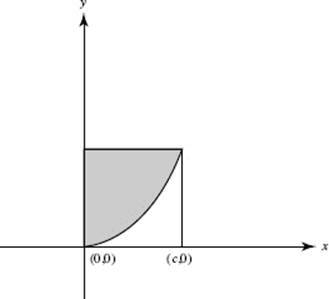 Which one of the following is an improper integral? 59. Which one of the following improper integrals diverges? 60. Which one of the following improper integrals diverges?